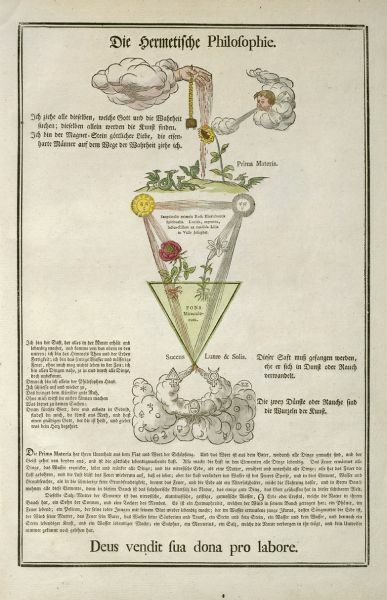 The Geheime Figuren der Rosenkreuzer, aus dem 16ten und 17ten Jahrhundert is a book printed in 1785-88 that draws on various alchemical and mystical eengravings and drawings in earlier manuscripts. One of the images shows and emblem of hermetic philosophy. It was reprinted around the beginning of the 20th century and more recently editions have been issued with an English translation. In Mellon MS 110 in Yale there is a similar drawing. This manuscript is dated to around 1760. 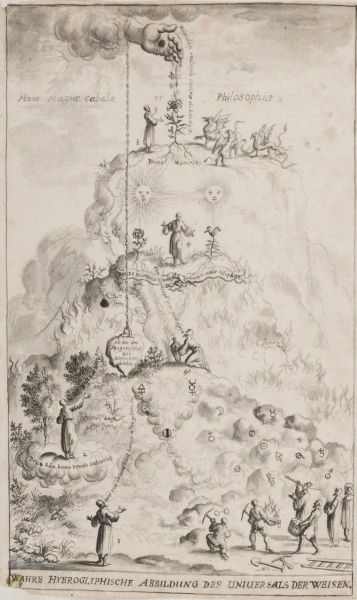 The Geheime figuren book from which we show the large plate, was printed 1785-1788, so it is likely that this drew on the earlier manuscript or some other copy. The manuscript version is symbolically more complex. It seems that the editor of the Geheime figuren wished to add explanatory text and somewhat simply the imagery. I will just outline the text and give some indications about the emblem itself. It is entitled at the bottom "The true hieroglyphic figure of the universe of the Wise". It depicts "the mountain of magic, cabala and philosophy" and presents a number of emblematic scenarios. Above the mountain the hand of God emerges from the clouds and from its fingers drops of liquid fall down onto the mountain top. This is labelled "The radical moisture of Nature, one light of Fire and Water." The idea of 'radical moisture' arises from Greek medicine, as transmitted in medieval Arabo-Latin medicinal manuscripts, and seems to refer to a moisture innate to living beings, a kind of watery life force. This radical moisture falls upon and appears to nourish a plant growing on the summit. 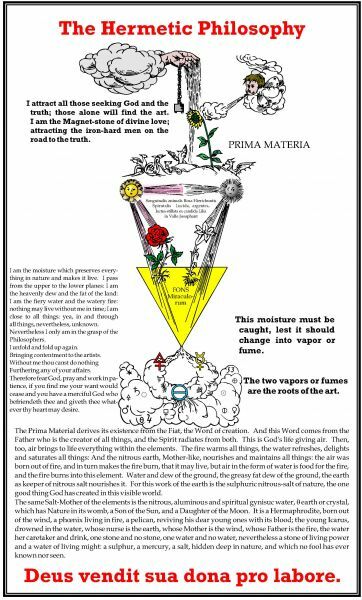 This is labelled "The prima materia". On the right are three winged dragons, while on the left is the figure of a philosopher who gazes on the scene. He is the observer of all the actions on the various tableau in this emblem. Beside him is the number '3'. We will see him again bearing the numbers 1 to 5. A path leads upto the summit from a lower summit upon which we see again our philosopher '4'. He stands between, and gestures towards, a rose on the left and a lily on the right. Below this is a label with the words "Rosa hierochuntis", which is the Rose of Jericho (known as the resurrection plant), and "Lily in the Valley of Josaphat", which is an other biblical reference to a plant associated with resurrection. Below this is yet another summit on which again our philosopher observer stands, here labelled '5'. He holds a pitcher and appears to be collecting water or liquid which flows down in a stream from the root of the rose. He is saying "O Jesus, I wish that you take all of me." At this point another connection is being made with the Hand of God in the heavenly world, for we see that there is a cord around God's wrist from which is suspended a large triangular stone. This bears the text "I am the magnetic Stone of the Divine Love." At the base of the mountain the Philosopher here labelled with a '1' stands with his arms outstretched viewing the scene. He says "The hand of the Lord gives all good things." On the lower part of the mountain to the right we see a group of miners. They examine and work with pickaxes the ores of substances in the mountainside. These are the gifts of God just mentioned. Here we have the alchemical signs for Mercury, Silver, Antimony, Salt, Vitriol and other substances important in alchemy. Our philosopher also can be seen in a cloud a little above his appearance at point '1'. He is now at point '2', where he says "Nothing is possible without God". The cloud on which he stands is labelled "By labours, God himself offers good things." I have here read this emblem from the top to the bottom as this is easiest to grasp, but it seems the emblem maker intended us to read it through the five stages. The first stage is the philosopher in the foreground gazing up at the mountain. He is lifted in a cloud and ascends to the top of the mountain where he finds the prima Materia. He then comes down the mountain, first stopping at the Rose and the Lily, both here associated with resurrection ideas. The red rose and the white lily are often emblematic of the two tinctures in alchemy, and we might assume this is what is intended here. He collects an essence from the root of the red, rosy, tincture, thus achieving the goal of the alchemical work.